It's 1976 and timid, Dorking-based sound engineer, Gilderoy, has been transplanted to Italy's run-down Berberian Sound Studio to work on The Equestrian Vortex, the latest low-budget horror movie by notorious exploitation maestro Giancarlo Santini. Gilderoy's task is a seemingly simple one: to create, record and mix the sounds of bloodcurdling screams, limbs being severed and the insertion of red hot pokers into human orifices, mostly using a variety of everyday household items such as old vegetables and a hammer. But Gilderoy is totally unprepared for the graphically grotesque images on show, the effect they have on him and for the unusual working practices of his employers. As he becomes more deeply involved in his work, the line between fantasy and reality becomes blurred and, very subtly, Gilderoy's life begins to imitate art in a nightmare scenario from which he may never escape. Winner of the Best Film, Best Director and Best Actor awards at the 2012 Film 4 Frightfest, Peter Strickland's disturbing, eerie chiller is a must-see for fans of the work of Dario Argento, Roman Polanski and David Lynch and features a revelatory central performance by Toby Jones and a superb soundtrack by British indie electronic band, Broadcast. It's certainly been a hit with reviewers. Peter Bradshaw in The Guardian said of it: "Seriously weird and seriously good. Toby Jones gives the performance of his career, and Peter Strickland has emerged as a key British film-maker of his generation." Anthony Quinn in The Independent described it as "Half-satire, half-Lynchian nightmare," and Robbie Collin in The Telegraph called it "One of the year's very best films, a great, rumbling thunderclap of genius." 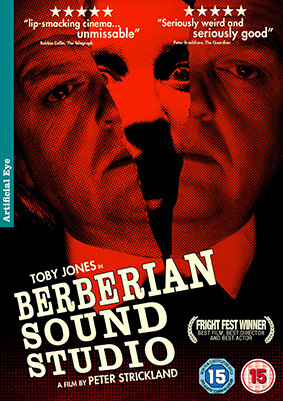 Berberian Sound Studio lands on UK DVD and Blu-ray on 31st December 2012 courtesy of Artificial Eye at the RRP of £15.99 for the DVD and £19.99 for the Blu-ray. We'd love to tell you about the extra features, but such info has not yet been confirmed.